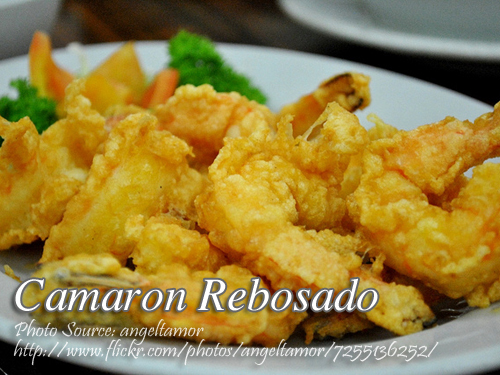 Camaron rebosado or simply known as battered fried shrimps is a tasty appetizer or viand. This shrimp dish is a Filipino version of tempura which is a Japanese dish. Preparation is very simple, you only need to make a batter and hand dip each shrimp in the batter then fry it until golden brown. When cooking shrimps, you will notice that the shrimps curl up. The technique for the shrimp to stay straight is by making a crosswise slit in the inner side of the shrimp. Of course a small piece of bamboo stick will work too by skewing so the shrimp will not curl. Just don’t for get to remove it after cooking. To cook camaron rebosado; Fold in flour, black pepper, and salt in well beaten eggs. Dip each shrimp (excluding the tail) into prepared batter and deep fry until golden brown. Serve with sweet and sour sauce. To see the complete recipe and list of ingredients in exact measurements, continue reading. ½ kilo shrimps, shelled with tail left. Fold in flour, black pepper, and salt in well beaten eggs. Dip each shrimp (excluding the tail) into prepared batter and deep fry until golden brown.